Severe winter weather is just weeks away in parts of the country where storms can begin in late November and last all the way through March. 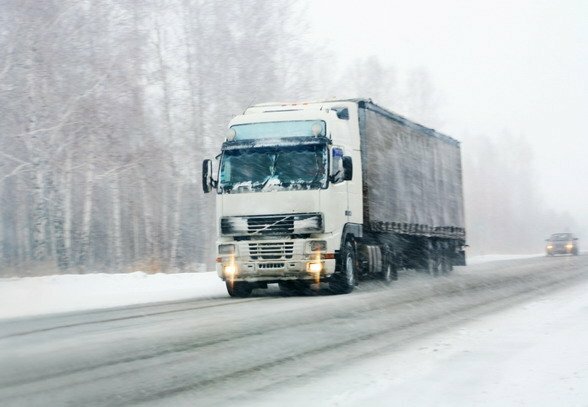 In the past, we have written blog posts detailing safe winter driving tips and how to apply tarps and other cargo control components in winter weather. In this post, we want to focus on some of the equipment drivers should have on hand if they are planning to haul flatbeds over the next several months. Obviously, tire chains and a good selection of high-quality flatbed truck tarps are prerequisites for winter weather. Departing without them wouldn’t be a good idea. But what else does a trucker need? Are there any other pieces of equipment truckers should be considering about above and beyond tarps, ratchet straps and bungee cords? Absolutely. No flatbed trucker should ever think about hitting the road without a solid, heavy-duty toolbox on board. During the winter, it’s worth carrying the extra weight to have a second tool box. The tool box is the prime storage area for everything from tarps to bungee straps to those extra hand tools that might be necessary to keep a truck going in bad weather. We obviously recommend aluminum as the construction material of choice. Aluminum is lightweight on one hand, durable on the other. If you have room on your truck, two tool boxes would be ideal for winter driving. You can never have too much storage for all the extra gear you need for the season. With the onset of winter is less daylight to work with. As such, flatbed truckers may find themselves loading or unloading in the dark. A good collection of work lights is indispensable. Work lights come in different sizes and shapes; they can be permanently affixed to a truck or moved around and used as needed. The presence of snow and ice in freight yards can make parking and stabilizing a trailer a bit tricky. If you have room in your toolbox, a good tool to have on hand during the winter is a trailer stabilizer dolly. This handy piece of equipment makes it possible to add extra support underneath a trailer to keep it stable on uneven ground. This isn’t something to leave behind, though. Cold temperatures can wreak havoc on air brake hose when temperatures get really low. More than one trucker has found cracked tubing that renders air brakes useless. Therefore, it goes without saying that the flatbed trucker needs a healthy supply of air brake tubing in the toolbox at all times, more so in the winter. You never know when an emergency brake repair going to be necessary. The relatively low profile of flatbed trailers makes them harder to see in inclement weather. Every flatbed trucker should have a supply of beacon lights to increase visibility. A couple of lights mounted in strategic positions could be the key to keeping you safe on the road. Winter is coming and with it a long list of extra challenges for flatbed drivers. Here at Mytee Products, we have everything you need to keep your cargo safe and secure in all kinds of weather. From truck tarps to chains to beacon lights and reflective tape, you can find everything you need quickly by browsing our online store. We make shopping for your truck driving supplies easy and convenient. Every seasoned truck driver is experienced enough to readily identify the truck air brake hose coils that run between tractor and trailer. However, for an inexperienced driver, the hose coils might be a mystery. We want to shed light on that mystery by explaining how they work and what their purpose is. To that end, in this post, we will be providing you with a holistic picture on the functionality of hose coils. First and foremost, the average set up involves two hoses and one electrical cable. The blue and the red hoses are used to operate the air brakes on the trailer while the green cable provides electrical service. Most of the time the three can be seen dangling independently. Trailers obviously need their own brakes and lights in order to be road legal. But it would be nearly impossible to create independent systems to make them function. Therefore, the trailer’s brakes and lights are connected to the systems on the tractor by way of electric and hose coils. Using straight hoses is entirely possible, and some drivers prefer that set-up. But straight hoses have an inherent flaw. In order to compensate for the wide turns that 18-wheelers have to make, hoses have to be sufficiently long enough to carry the distance as tractor and trailer separate on a turn. All of that excess hose is then left to hang freely once the rig straightens out again. This presents a problem in as much as hanging hoses could easily be damaged by road debris and wind. The solution is to deploy truck air brake hose coils instead. Coiled hoses do not dangle. They act like springs, stretching out as tractor and trailer separate and retracting as they come back together. The hose coil design eliminates dangerous dangling and reduces the risk of damage. As good as the coil design is for truck brakes and electrical systems, they do possess some challenges. First is the tendency of truck air brake hose coils to get tangled. Think of it in terms of a coiled telephone cord. If you are old enough to remember them, coiled telephone cords tend to get tangled after just a couple of weeks of use. And once they tangle, they can be difficult to get untangled. If a brake hose coil were to tangle en route, the next turn could pull air hoses right out of their couplings. The other inherent weakness is that hose coils tend to be more prone to severe temperatures in either direction. Because there is more material to work with, and that material has to remain flexible, severe temperatures can cause cracking and breakage. Fortunately, this does not happen all that frequently thanks to the superior materials manufacturers now use. Here at Mytee Products, we now carry truck air brake hose coils and other related products. We are especially proud of the Tectran 3-in-one AirPower Line that all but eliminates what Tectran affectionately refers to as the ‘rats nest’. With this brand-new product installed, you will never have to worry about your hose coils getting tangled again. You can check it out here on our website. Truck air brake hose coils are a normal part of the trucking business. As a truck driver yourself, you want the highest quality hoses and coils you can get your hands on. You want tough products that are well-built and reliable, but still well within your budget. We have just what you need here at Mytee Products. Our role as a leading provider of truck tarps, cargo control equipment, trailer parts and other trucking supplies gives us the opportunity to speak to a lot of people within the trucking industry. It also gives us the opportunity to explain some of the finer points of how trucks work. For example, we sometimes have to explain that a truck air brake and Jake brake are not the same thing. What confuses people is the fact that the Jake brake releases compressed air when activated. It’s true that both truck air brakes and Jake brake are related to compressed air in terms of function. But that’s the only similarity. The standard air brake is the truck’s equivalent to the hydraulic brakes on a standard passenger car. The Jake brake is not really a break at all. It is a mechanism that helps slow down a truck by manipulating how the diesel engine fires. Both kinds of brakes are explained below. A typical truck air brake system utilizes a combination of storage tanks, pumps, and valves to pressurize and depressurize the system. When the tank is empty, the system is depressurized. This results in brakes being fully deployed. In order to release the brakes, the storage canister must be filled with air. This is what we call recharging. The need for recharging explains why truckers have to let air tanks fill up before they can engage first gear and drive away. Inside the cab, deploying the brakes works the same way as it does in a standard passenger vehicle. The driver simply depresses the brake pedal to stop the vehicle. What’s different is this: instead of forcing hydraulic fluid into the brakes, depressing the brake pedal releases air from the storage tank, thereby moving a piston that forces the brakes to engage. Releasing the brake pedal allows the system to recharge itself, releasing the brakes. A Jake brake is a compression release engine brake attached to a diesel engine. Activating the brake opens exhaust valves on the engine to release some of the compressed air inside. This slows the vehicle by slowing down combustion. The Jake brake can slow an idling vehicle substantially. To understand this better, think of your own passenger vehicle. Even when you take your foot off the accelerator, power is still being transferred from your engine to your transmission and wheels. The only way to interrupt that power is to either shift the car into neutral or shut off the engine. The same is true for big trucks. The Jake brake slows the truck by reducing the amount of power transferred to the wheels. It allows the truck to slow even when it is still in gear, which is why you might sometimes hear the loud noise caused by a Jake brake as a truck rolls through a lower speed zone. Rather than disengage the gear and apply the standard air brake, a driver may simply choose to take his/her foot off the accelerator and temporarily activate the Jake brake. The main downside to the Jake brake is that it can make a tremendous amount of noise when deployed. For that reason, some municipalities have limited the use of Jake brakes within their jurisdictions. As for the standard truck air brake system, it also makes a unique sound. Deploying air brakes tends to make a whooshing sound followed by a hard squeaking. Neither of these noises is terribly loud as long as the system is functioning properly. Every year, officials in North America join forces to run what is known as ‘Operation Airbrake’, an initiative designed to monitor commercial motor vehicles with brakes that don’t function up to required standards. In 2016, inspections were carried out in May. The good news is that only 760 trucks with potential brake problems were identified. The take-away for truck drivers and carriers from the inspection was – the importance of brake safety. According to news sources, certified inspectors checked over 6,100 trucks and buses as part of the single day inspection. Among the trucks whose brakes were found to have problems, the split was even between hydraulic and air brake systems. Truck drivers and carriers know that their hydraulic brakes or air brakes are critical to stopping large commercial vehicles. But what we sometimes forget is how easily brakes can be compromised when components like truck air brake hose or couplings begin to wear. Because braking systems are under such intense pressure, it doesn’t take much to compromise a system. We found it interesting that among most of the violations discovered this year, problems were related to ABS rather than the actual air brakes themselves. While ABS problems are not necessarily good problems to have, they are less serious than actual air brake failure. Air brakes are primarily mechanical systems that, if nothing else, will deploy and lock down if they fail completely. When an ABS fails, you are talking about an entirely different problem altogether. Having said that, drivers and carriers need to remember that a fully-loaded tractor-trailer requires twice the stopping distance as a passenger vehicle at 55 mph. That is under ideal conditions. As conditions begin deteriorating, greater stopping distances may be required. This is why it is critical to make sure braking systems are in optimal shape. All truck drivers in the U.S. are required to test their brakes as part of their pre-trip inspections. The required test does not necessarily mean getting under the vehicle and checking truck air brake hose connections and tanks. But it does mean completing a few simple procedures inside the cab to make sure everything is working properly. Following an established procedure ensures that proper testing is carried out before every trip. A failure to test brakes is not only a violation, but it could also endanger both, the driver and others on the road. As Operation Airbrake demonstrates, there are trucks out there with brakes that are not up to standards. As a leading provider of equipment and supplies for truck drivers, Mytee Products has some of the supplies you will need to maintain your air brake systems. For example, we carry truck air brake hose coils, air brake tubing, airline hose with flexible assemblies, aluminum glad hands, and more. While you are browsing our air brake supplies, don’t forget to check out our tarps and cargo control supplies. We have just about every kind of tarp you will need along with everything from corner protectors to ratchet straps to bungee straps. We strive to be your one-stop supplier for everything you need to keep your truck driving safely on the road. The air brake system on a tractor-trailer is a complex system that includes storage tanks, a compressor, valves, hoses, and two different kinds of braking systems: service brakes and emergency brakes. Everything working together ensures that a truck is able to stop safely under any conditions. Yet it only takes one failure to create a serious problem. Those coiled hoses you see spanning the distance between tractor and trailer are known as truck air brake coils. Actually, two of them (one blue and one red) are hoses that work the air brake system on the trailer. The other is a cable that supplies the trailer with electric service. Truck air brake coils are a critical link between tractor and trailer. If the two hoses and one electrical cable do not functioning properly, a dangerous situation could arise. For example, a driver could be trying to stop without using the trailer brakes, increasing the chances of a dangerous jackknife. Alternatively, a malfunctioning trailer system could deploy by itself while the truck is in motion. This could result in loss of control. It is critical that truck drivers maintain their air brake coils in top condition. These should always be inspected prior to each journey to ensure they are in good working condition. The emergency brake system does two things. First, it allows the parking brake to be deployed if needed. Second, it maintains a small amount of pressurized air in reserve to stop the truck just in case there is a leak in the service brake system. Emergency brakes exist in both tractors and trailers. We include emergency brakes in our top three most important components because they provide redundancy. The last thing a truck driver needs is to attempt to stop his/her vehicle, discover he/she has an air leak, and not be able to keep the vehicle under control in order to avoid an accident. Emergency brake systems are designed to give the truck driver that needed control. Third on our list are the air compressors that make everything work. You can have truck air brake coils and emergency brake systems in perfect working order that could suddenly become useless if compressors fail. Compressors are to air brake systems what fluid reservoirs are to hydraulic brakes. Unlike hydraulic fluid reservoirs, pressurized air tanks do not maintain a constant level of air on their own. In a hydraulic system, fluid is forced back and forth as the brake pedal is pressed and released. It is a closed system that maintains a constant level of fluid as long as there are no leaks. Air brakes are not a closed system. When a driver steps on the brake pedal, pressurized air is released from the storage tank then moves through the hoses and into the brake system where it activates a piston that activates the brakes and linings. But releasing the brake pedal does not force the air back in the opposite direction. Instead, air is simply released. It is the job of the compressors to recharge the tanks before the brakes are needed again. Every part of an air brake system is important, but these three components are at the top of our list. What would be on your list?